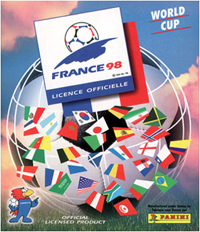 Details: The Sticker Collection "World Cup France 98™" includes 561 stickers, each one measures mm 49x65. The album has 64 pages. Each packet contains 5 stickers. NOTE: A set of special Pop-Up stickers were also produced for the Spain Team. These have been numbered with the addition of the letter P.